‘Prester John’, Encyclopaedia of Blacks in European History and Culture (2008), Vol. II, pp.423-424. Prester John, from a Portuguese map, 1558. 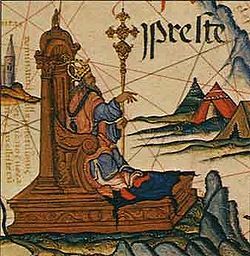 Prester John was a mythical figure, who from the twelfth to seventeenth centuries, was thought by Europeans to be a real personage, ruling over a distant Christian empire, originally located in Asia, but from 1300 onwards increasingly associated with Ethiopia. Europeans wanted to believe in the universality of Christianity and in a potential ally in their struggle against the Muslim powers. The first written reference to Prester John appeared in the Chronica of Otto van Freisingen (1145), which reports that the emperor had set out with an army to help the Crusaders in Jerusalem, but was unable to cross the Tigris. In 1165 a letter addressed to the Byzantine Emperor Manuel Comnenus (1143-1180) from the ‘supreme ruler of the three Indies’, Prester John, circulated around Europe. In 1177, Pope Alexander III sent a reply, but no response was received. The mythical emperor was, most importantly, a Christian: Prester’ signified ‘priest’. It was thought that he was descended from of one of the Three Magi, and from the queen of Sheba, and that his empire was vast, with 72 dependent kingdoms. Thus he had massive military power and untold wealth. The sultan of Cairo was said to pay him tribute, owing to his power to change the course of the Nile, which had its source in his kingdom. The oldest surviving map that portrays Prester John is a portolan chart made by Angelino Dulcert (Mallorca, 1339). Increasingly, Ethiopia was marked on maps as the kingdom of Prester John, probably because of the arrival of regular Ethiopian embassies in Europe from 1329. These delegations visited Venice, Rome, Aragon, Naples, Milan and established a permanent home in Rome at St. Stephen of the Ethiopians, where from 1537 to 1552, Tasfa Seyon, or ‘Peter the Ethiopian’, edited a New Testament in Ge’ez, the Ethiopian liturgical language. Geographers, however, were not entirely sure where Ethiopia was. The name appears in seven different locations on a Genoese world map of 1457. The Portuguese voyages to Africa from the late fifteenth century led to the modification and ultimately the dispelling of the myth which had partly inspired them. In 1484, the king of Benin told the Portuguese of a ruler named Ogàmé, a lord of lords, who lived 250 leagues east of Benin and gave his dependents a little cross to cement their friendship. This gave the Portuguese hope that they were close to finding the legendary ruler. In 1521, King Manuel of Portugal wrote to Pope Leo X to tell him that Portuguese captains had found Prester John in Ethiopia. Francisco Alvarez, who spent six years at the Ethiopian court of Lebna Dengel (David II) and Queen Helena, wrote an account which exploded many of the myths. Europeans began to realize that the Prester’s territory was not so vast, his people so Christian, nor his treasury as bottomless as they had dreamed. Although it gradually became clear that even the name ‘Prester John’ was a European invention rather than an Ethiopian reality, the myth lived on, inspiring writers from Shakespeare and Samuel Johnson to John Buchan and Umberto Eco. Francisco Alvarez, Ho Preste Joam das indias. Verdadera informaçam das terras do Preste Joam (Lisbon, 1540)/The Prester John of the Indies : a true relation of the lands of the Prester John, being the narrative of the Portuguese embassy to Ethiopia in 1520 ; the translation of Lord Stanley of Alderley (1881) revised and edited with additional material by G.F. Beckingham and G.W.B. Huntingford. (Hakluyt Soc., 2nd ser., nos. 114-115, Cambridge, 1961). L.N. Gumilev, Searches for an Imaginary Kingdom: The Legend of the Kingdom of Prester John (trans. R.E.F. Smith, Cambridge, 1988). F. Relaño, The Shaping of Africa: cosmographic discourse and cartographic science in late medieval and early modern Europe (2001). R. Silverberg, The Realm of Prester John (1972).